Successfully Added Car MP3 Player with FM Transmitter + Speech Recognition to your Shopping Cart. We all love listening to our favorite MP3s while driving. However, using an MP3 player while driving is not only dangerous to you, but dangerous to other drivers and pedestrians as well. Thankfully the days of juggling your MP3 player while driving are now over thanks to the first ever MP3 player with speech recognition. This amazing device allows you to select songs by simply saying the name of the song you wish to play. The speech recognition software then automatically locates and plays the song for you in less than a second! The music is sent wirelessly to your car stereo system using the built in FM transmitter, or you even have the option of using the built in 3.5mm headphone jack. The sound quality of this device is amazing too. That’s because this device uses an advanced audio chipset that is capable of producing clean, crisp and accurate sounds that are a real pleasure to listen too. If high quality audio is your thing-- then this is the perfect MP3 player for you. And if you really want to get the best quality audio from this device you can upgrade to some IEM (in ear monitors) earphones and enter a state of musical bliss! This MP3 player is not limited to car use either. Place this device in your pocket and enjoy high quality music wherever you go, or, you can even use it wirelessly with your home stereo system! 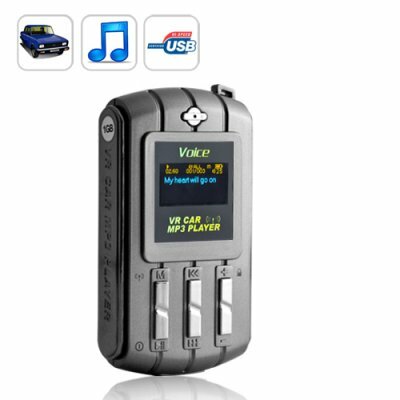 If you’re looking for a high quality MP3 player with speech recognition for your car or home, then you have found the right product. Place your order now and we will express ship your package by tomorrow. Driving while using headphones is considered dangerous and is not recommended. Can I use this without the speech recognition? Yes. There is hard buttons for you to use if you do not want to use the speech recognition function. Want more information about the world of China Electronics? Do you want to read stories regarding new products before anyone else?